On Friday (24 Jan) I visited Margate as part of my Planning brief to meet local traders and customers, along with local councillors, in order to discuss the importance of supporting local high streets and regenerating town centres. I have been working with local councils, businesses, organisations and communities to better understand the problems being faced by local communities like Margate and the issues that matter to them. 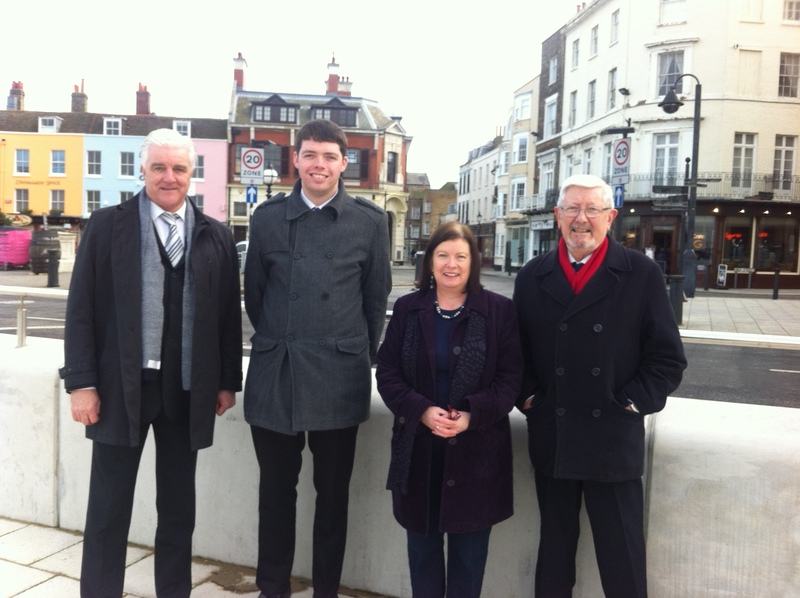 As part of the visit, I was shown round Margate’s seafront, old town and the Dreamland site with Council Leader Clive Hart and Labour’s prospective Parliamentary candidate for South Thanet Will Scobie. My visit also included a discussion with the Margate Town Team and local council on re-invigorating Margate High Street for the benefit of local people and visitors alike. 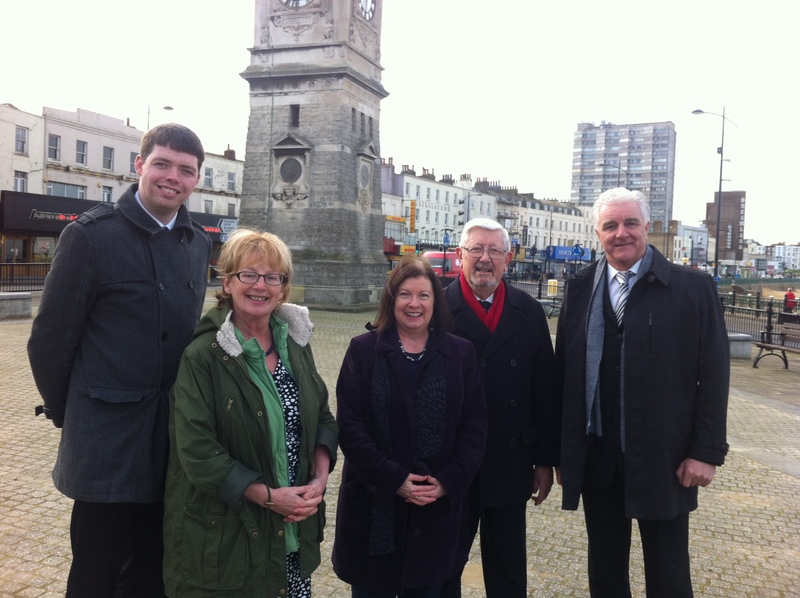 It was great to see the regeneration work that has taken place in the town in the last decade and to look at how other towns throughout the country can learn from Margate’s successes. I was really encouraged by the forward thinking of the local council and Town Team and their exciting future plans to further improve the town. Both the importance of improving the town centre for the local community as well as the key role regeneration plays in attracting tourism and visitors to the town cannot be emphasised enough. This is why Labour has set up a High Streets Advisory Group, which I am proud to be part of, to look specifically at issues affecting local high streets and town centres such as Margate, including business rates and empty shops. A number of things struck me while visiting Margate that I will feed into our next High Streets Advisory Group meeting. Firstly, it is important to understand how long the process of regeneration takes. There is a definite need to develop a more long term, strategic approach to High Street regeneration. It is vital to bear in mind that it isn’t just individual buildings and new developments that we need to get right- we need to plan for the whole street and wider neighbourhood. Crucially, if the ideas of the community are on board then I think we are much more likely to get consent for the developments, which has been missing from a lot of the discussions. The role of local authorities in all of this needs further consideration. Secondly, lots of issues were raised about the level of business rates especially in areas like Margate that need to regenerate after years of struggle and now have an acute need to support and grow local independent shops. Several innovative solutions, including pop up markets and shop-shares, have helped new and smaller local businesses in Margate and we can learn from this, but more support is needed. Thirdly, there is clearly a problem of absent or uncooperative landlords and councils and local authorities need more powers to deal with empty and rundown buildings. This would empower communities to shape their own local high streets and town centres. Fourthly, planning delays were identified as a major issue by many of the local people I spoke to during my visit. I really enjoyed my visit to Margate and I want to thank all those who helped make it so interesting and those who contributed to the discussions, particularly local council leader Clive Hart and PPC Will Scobie. On Monday (20th Jan) I took the opportunity to speak in an important and very well-attended debate on pay day loan companies in the House of Commons. Many of those who spoke agreed that there is an urgent need to improve the regulation of this industry. I spoke about the devastating impact pay day loans can have on the lives of many people in my constituency, and particularly those who are vulnerable and already struggling with their finances. Also on Monday (20th Jan), I joined my colleagues in the Shadow Communities and Local Government team on the frontbench and questioned Nick Boles, the Planning Minister on why the Government is taking away powers from local councils and communities and making it harder for local people to shape their high streets. Localism was a key Conservative pledge during the 2010 election, but the NPPF and the Growth and Infrastructure Act 2013, along with reams of secondary legislation and vicious local authority cuts, have completely torn apart the Government’s promise to instil localism in the planning system and it appears that this is only likely to get worse in the coming months. Roberta Blackman-Woods (City of Durham): I thank my hon. Friend the Member for West Bromwich West (Mr Bailey) and the Business, Innovation and Skills Committee for their excellent report on payday lending and for doing so much to raise the profile of the issue, including by stimulating debate. There is a strong degree of cross-party consensus on what needs to be done. I thank my hon. Friend the Member for Sheffield Central (Paul Blomfield) for doing so much to bring the problems of payday loans to our attention. Most MPs will know from their constituency casework, and from the growing number of payday loan companies on our high streets, that payday loans are becoming more of a problem for our constituents. I hope to be able to run through my four main concerns, the first of which is the exorbitant interest rates charged by those companies, which should not be tolerated in our society. Pay-back rates of 5,800% are not unheard of, and APRs of 2,600% are not at all unusual. That creates huge problems for people paying back the loans. Despite this, more and more people have to turn to payday loan companies just to make ends meet. That indicates that there is a huge cost of living problem in our society, and that many jobs simply do not pay people enough money to live on. In 2010, just 1% of people getting advice from citizens advice bureaux had debt from at least one payday loan. That rose to 4% in 2012 and 10% this year. Evidence from Citizens Advice also reveals irresponsible lending, and says that it is intrinsic to the industry. New 12-month figures from the national charity’s payday loan tracker reveal that 61% of loans still come without proper checks to assess whether borrowers can afford to repay. It also found not only that three out of four borrowers found it difficult to repay their loan, but that in 84% of cases lenders were breaking their promises to freeze interest and charges for those who were struggling. National Debtline says that calls for help with payday loan issues soared from 776 in 2008 to more than 20,000 in 2012. A ComRes survey found that 98% of MPs and 93% of the public believe there is a problem with payday lending, and that 66% of MPs and 65% of the public support a cap on the total cost of credit. It is hardly surprising, therefore, that the Government were forced to take action earlier this year, but I am not sure that requiring the FCA regulator to clamp down on excessive interest rates is really good enough, especially when it will be some months before any such scheme can be implemented. Labour put forward an amendment to the Financial Services Bill, which would have given the new FCA clear powers to tackle the overall cost and duration of high-cost loans, especially where it could demonstrate consumer detriment. It is a real pity that the Government did not accept the amendment. My second concern is the methods used to trap people in cycles of debt. I have a constituent who, when desperate and applying for a loan, was told that she had to give her mobile phone number. Thereafter, she was sent texts that offered her more loans and offered to give her more money to pay outstanding loans. She was contacted at the end of the month, when she was particularly short of money, and urged to take out more loans. When she came to my surgery she was literally at her wits’ end and did not know what to do. That case is not unique and we really should not continue to allow companies to behave in this way. If this sort of bullying was taking place anywhere else, it would be tackled. My hon. Friend the Member for West Bromwich West mentioned how advertising is increasingly being targeted at children. Again, that is a disgrace and something that should be brought to an end immediately. Research shows that of those sampled who had taken out a payday loan, 60% regret the decision and 48% believe that their loan has made their financial situation worse. Only a tiny number think it has had a positive impact on their finances. My third concern relates to the proliferation of these companies on our high streets. Action the Government have taken to deregulate use classes and permitted development rights means that it is much easier for payday loan companies to set up on our high streets without having to gain planning permission. This is a step in completely the wrong direction. We are urging the Government to take action on this immediately by returning powers to local councils and local communities, so that they are able to reduce the numbers of payday loan companies on their high streets. We know, from a number of different surveys undertaken with communities, that local people want those powers and they want their councils to be able to reduce the number of payday loan companies in their area. My fourth point concerns the way in which payday loan companies target disadvantaged areas and prey on poor people. Research recently carried out by Professor Sarah Banks at Durham university described payday loan companies as preying on the poor. She said that many people have multiple loans with payday and doorstep lenders at annual interest rates of up to 4,000% even though their incomes are very small, and that the companies did not even look at the other debts people had or whether they could afford to repay them. They lent to people, even though some of them had only very small amount savings or no savings at all. She gave lots of examples of the unscrupulous way in which loans were being targeted, particularly at those with very low incomes. As several hon. Members have said, we need to find ways out of this situation, and one of them is to support and promote credit unions better. I am pleased that our new Bishop of Durham has signed up to the Durham County credit union. It is important we see this as a way of fighting poverty, particularly in areas like the north-east that still have very high rates of unemployment and where people are losing lots of money through welfare reforms and increasingly being driven to loan sharks just to make ends meet. We must ensure that people see credit unions as a viable way forward and give them the support they need to join them. Welcome to my blog! These are some of my thoughts and reflections as a Labour MP proud to represent the City of Durham and as Shadow Minister for Planning.